The “GivaGeta” kind little reminders are Fun to Give … Fun to Get™ in school to support school climate programs with the included “learn-by-doing” turn-and-talk activity, inspire staff at work, and a meaningful giveaway at your club, or for your event, conference, and community based organizations. 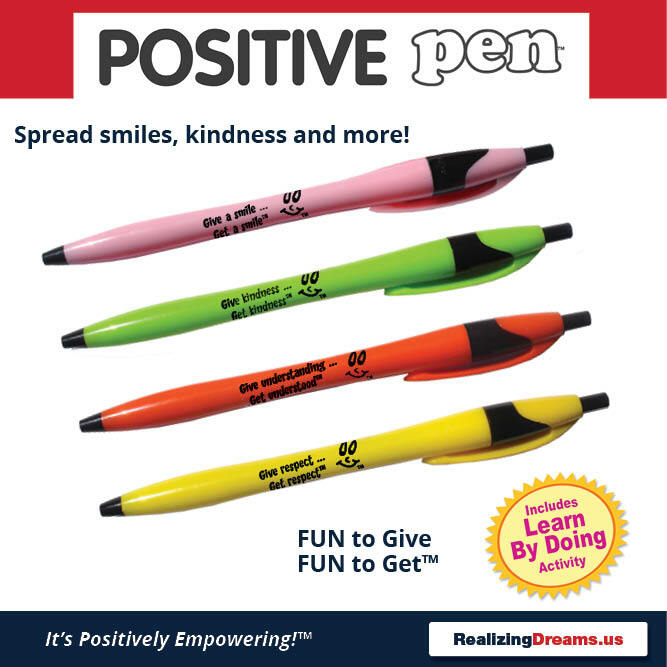 The Positive Pen™ Pack includes 25 pens in assorted messages and high energy colors of pink, green, orange and yellows. Black ink. See below for special and bulk orders and other ink color available. Get ready to spread catchy, kind, positive messages! A Positive Pen™ is a pen with a purpose. Many people tell us, “This is my FAVORITE pen”. It may just become yours too! 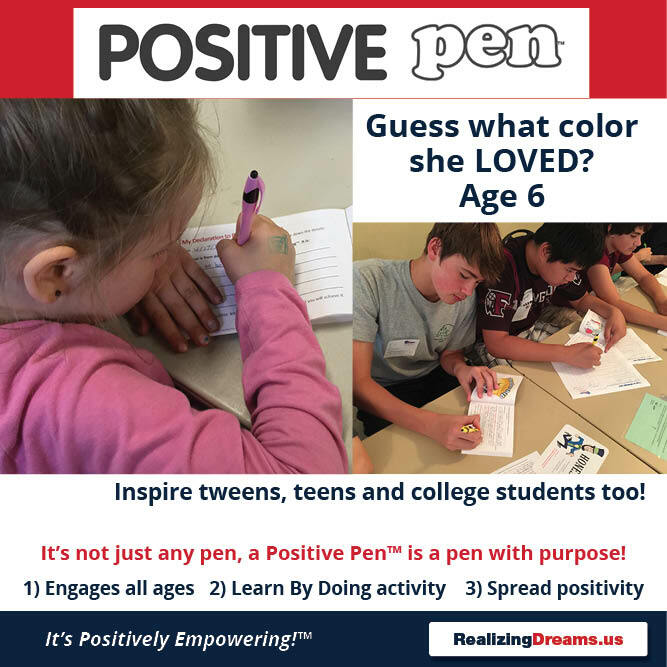 A Positive Pen™ is comfortable to hold, writes well and has a short catchy, positive messages that spread smiles, kindness, understanding and more. Includes learn-by-doing activities with fun turn-and-talks that inspires all ages. Special and Bulk Orders: Do you need Blue ink? Do you want ALL the same messages and/or pen colors? Call us at 860.657.0770 to also ask about our bulk pricing for orders of 5,000 pens or more. 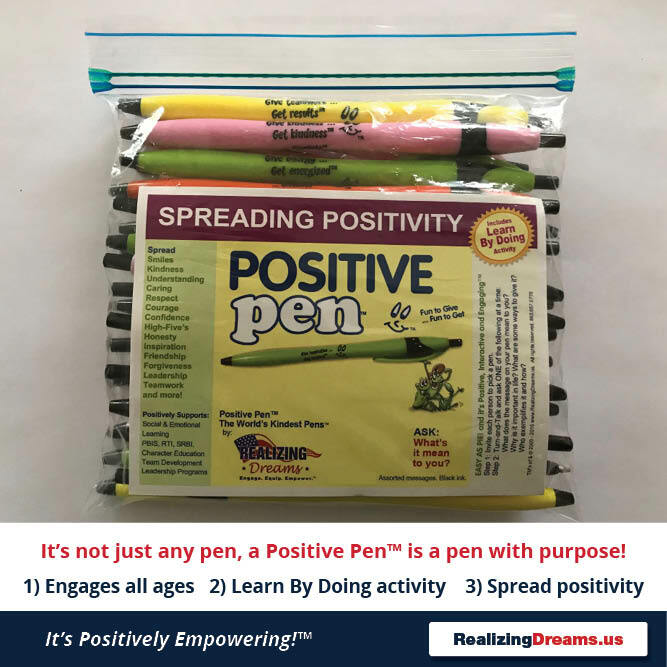 Companion Tools: You can also use your Positive Pen™ to complete your Dream Tag™ and the companion reflective action journal, 7 Steps for Empowering Youth: Self-Awareness Developing Grit an d Growth Mindset. It’s as EASY AS PIE! …and it’s Positive, Interactive and Engaging™. 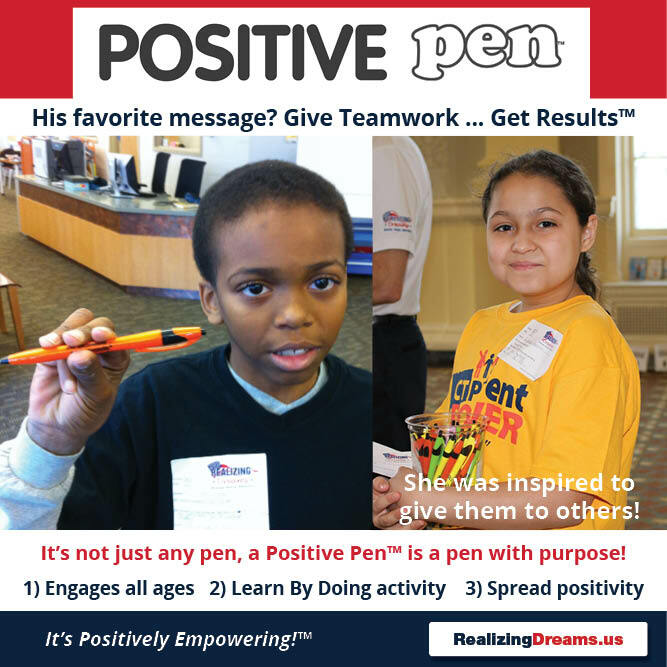 Invite each person to pick a Positive Pen™. What does the message on your pen mean to you? What are some ways to give it? Who exemplifies it and how? Social and Emotional Learning, (SEL) – In school, teach kids the power of their smile, how to be kind, caring, positive and more. PBIS, PBS, RTI, SRBI, Positive Psychology Mirror Neuron that create the “positive affect”. Leadership Development programs and more! Your Positive Pen™ assortment may include these GivaGeta™ messages. If you want to ensure you get specific messages, please contact us at 860.657.0770. The following GivaGeta™ messages are also available on request. To get these and other GivaGeta™ messages that are not listed here, please call us at 860.657.0770. Note: There may be a minimum order of 250 pens.